Satisfy your customers' cravings with this mouthwatering Grandma Jack's 32 oz. gallon gourmet bacon cheddar popcorn! 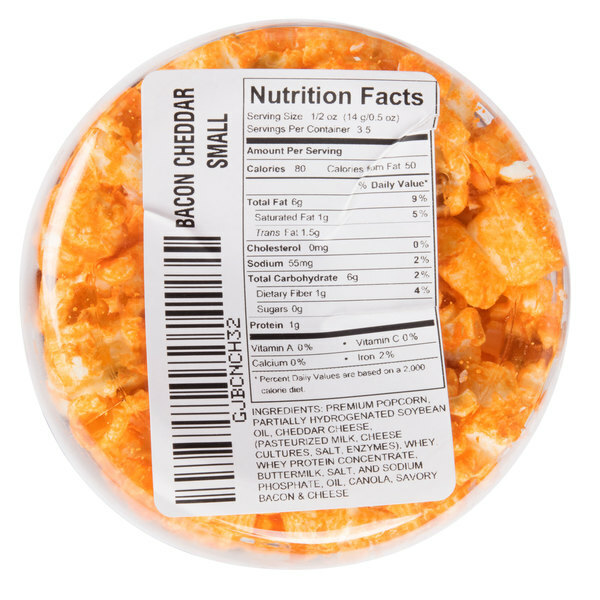 If you've been craving the taste of gourmet-style popcorn, look no further than this Grandma Jack's bacon cheddar popcorn! This delectable gourmet pre-popped popcorn is a perfect addition to any gift shop or upscale coffee shop and is sure to be a favorite among your customers. "A great tasting popcorn with a unique seasoning combination. The bacon cheddar is so good and taste real. We love using this in tailgate baskets." This pre-popped gourmet popcorn has an addicting savory and smoky flavor with a delightfully crunchy composition. It combines the taste of cheddar cheese and bacon to create a bold, flavorful taste that will appeal to the masses! This popcorn is packaged in a 32 oz. 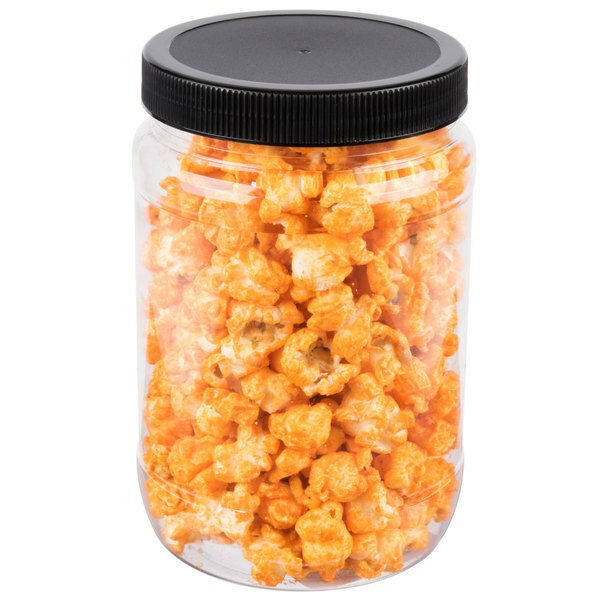 clear plastic can for a charming, home-style look and large quantity that lends itself to holiday or year-round gifts. Offer it to your guests at your coffee shop counter or in your establishment's gift shop for a take-home taste they'll never forget! This popcorn combines homemade, timeless appeal with big flavor! It all started with a family popcorn recipe that was too good not to share with the public. Now, it is hand crafted in small batches in the heart of Pennsylvania Dutch Country and remains a local favorite! 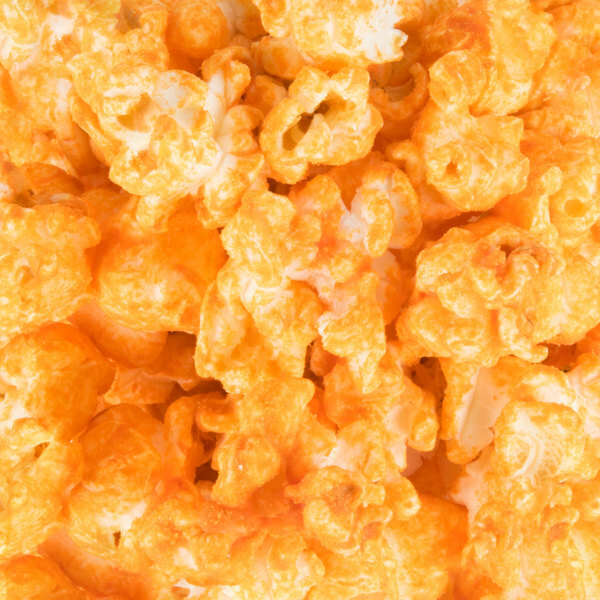 Whether you are eating from the top of the can or the bottom, this popcorn maintains a consistent, melt-in-your-mouth flavor, bright orange color, and texture! Grandma Jack's creates premium products that are made with fresh, natural ingredients and no added preservatives for a quality taste you can feel good about serving. Is this item measured in fluid ounces or by net weight? The package size for this item refers to its volume rather than weight. It measures how many ounces are in the entire container. This is not the same as the overall weight of the product. I got this kind of popcorn as a gift for my father for Christmas and he said it was really good. he said (jokingly- but seriously lol) that hell expect more for his Birthday. so, guess it must be yummy! Bought these to give as a gift because they were a flavor I had not seen before at a really reasonable price. Those hat received them absolutely love the flavor and want more! 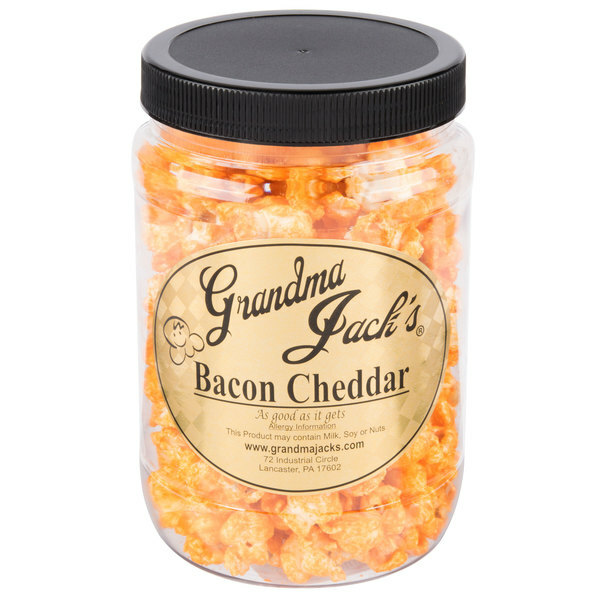 I had never tasted this thirty-two ounce Grandma Jack’s Gourmet Bacon Cheddar Popcorn before and I was a little disappointed. The popcorn has a beyond bland taste and overall I was very disappointed. I would not order again and would not recommend. 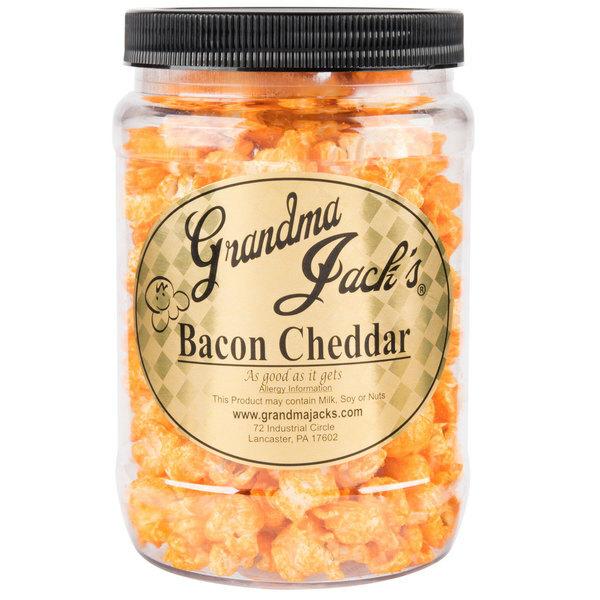 The Grandma Jack's gourmet bacon cheddar popcorn is great. The cheddar flavor is rich and decadent and the added bacon is unique. My friends love this popcorn and makes a great addition to our beer basket. I had never heard of Grandma Jack's until I saw it on Web restaurant store and decided to order some. Well, Now I'm hooked and it's my favorite gourmet popcorn and I buy it all the time! I also love giving it as a gift! The popcorn is great quality and a really great price! 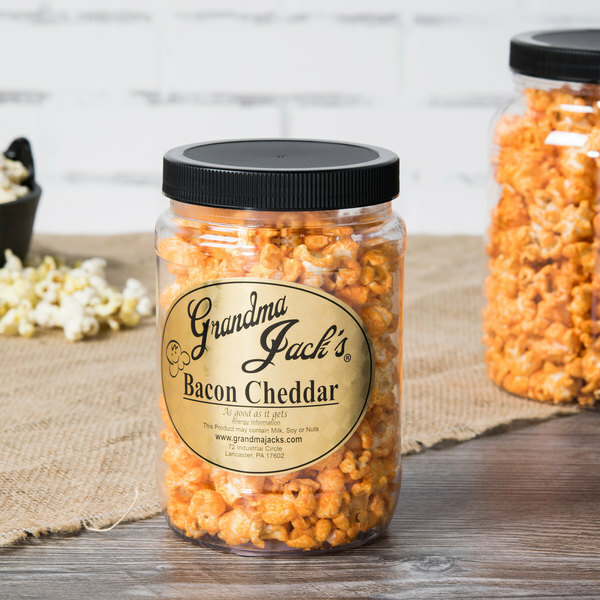 I am on the fence with the cheddar bacon grandma Jack's popcorn. The popcorn taste fresh and cheesy. The bacon part is kind of strange. Its got a smoky flavor to it. Not bad, I'd still eat it! I have never had a bacon flavored popcorn until now but it is true bacon makes everything better and that is the case with this bacon cheddar popcorn. It tastes awesome!!! A great tasting popcorn with a unique seasoning combination. The bacon cheddar is so good and taste real. We love using this in tailgate baskets. Tastes great! The bacon flavoring is so believable, almost like they used bacon grease to hold the cheese dust to the popcorn! The cheese is soooooo good! I spent probably twice as long licking my fingers as I did actually eating popcorn. I'm looking forward to trying other flavors, and am definitely getting a few of these as Christmas gifts for several of my friends and family members. This popcorn is made by hand in PA. That’s where I’m from, so I love that I can get a taste of home in when I live in a different state now. Who doesn’t love cheddar popcorn? !